Jacklyn Kaiser, an associate teacher, helps a student with a reading assignment at Bullis Charter School. 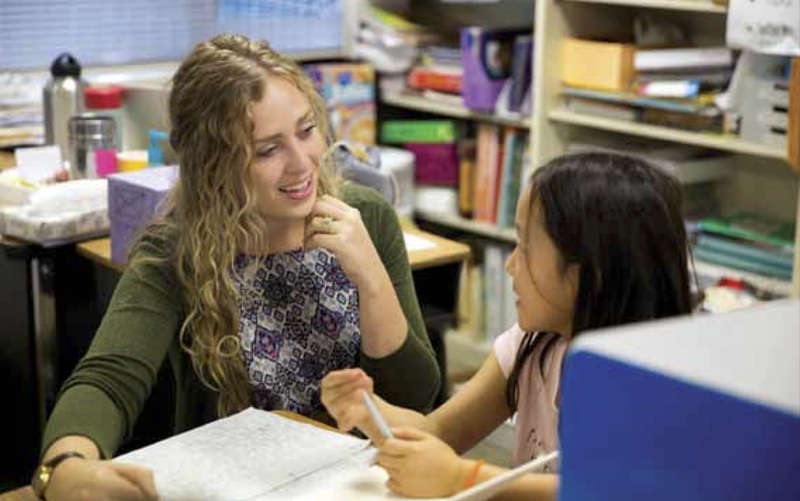 The school’s associate teacher program aims to improve teacher training and retention by offering new educators a supportive co-teaching program for their first year in the classroom. 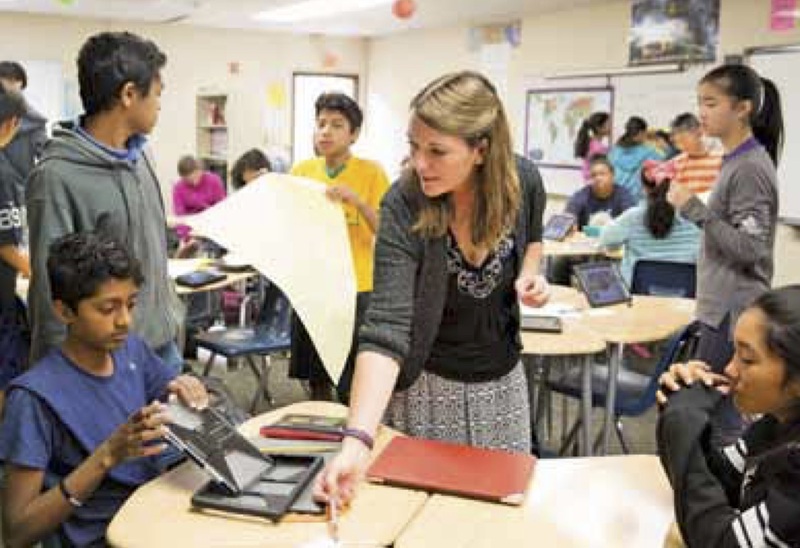 The steep learning curve is blamed for a whole host of ills, from high teacher turnover rates to acting as a deterrent to entering the profession, leading some schools to create programs to help nascent teachers get a handle on their first year in the field. But a new study released last month found that California schools could take it one step further, allowing new teachers an entire year-long “residency” alongside experienced staff, learning the ropes. The study, released last month by the Bank Street College of Education, took a close look at Bullis Charter School’s Associate Teacher program, which provides already-certified teachers with a full year of experience co-teaching in a classroom — sort of like a teacher aide with much greater responsibilities. The study found that the residency was not only effective at giving teachers the hands-on experience sorely missing from most teacher credential programs, it was entirely possible to replicate in schools and districts without breaking the bank. “They are really successful, quality programs, and when those grant dollars die, they don’t know how to continue to support the model,” she said. The study focusing on Bullis Charter School — part of a larger body of work dubbed the “Sustainable Funding Project” — uses the charter school’s Associate Teacher as a sort of proof of concept, that schools can pull off a long-term teacher training bridge that can act as both a pipeline for teacher hiring as well as a staffing boost in the classroom, meaning more one-on-one student support and lessons better tailored for diverse classrooms. Sara Fernandez, a fifth-grade teacher at Bullis, called her year as an associate teacher an “amazing” opportunity full of direct teaching experience and immediate feedback from teachers across all three fifth-grade classrooms. There’s a whole different world of teaching that you aren’t prepared for when you come out of a teacher training program, she said. After going through the Associate Teacher program, Fernandez said she directly transitioned to a homeroom teacher job at Bullis with great ease because she was already acclimatized to the school’s culture, families and classroom norms. Knowing which teachers to go for advice and the “ins and outs” of each school system has its own learning curve as well, she said, so she was able to direct 100 percent of her attention on students and teaching. Jessica Morgan, an eighth-grade teacher at Bullis Charter School, says the associate teacher program effectively bridged the gap between getting her teaching credentials and joining the workforce. “We tag-team on supporting the kids in ways that really meet them where they’re at as individual students,” she said. Back when she was an associate teacher, Morgan said the program was a little more experimental and looked different from one classroom to the next — the Associate Teacher program is more formally structured and has a designated “mentor” teacher — but she nevertheless found it an effective bridge between getting her credentials and joining the workforce as a classroom teacher. “I will always tell everyone that, no matter how confident I felt leaving the credential program, I did not have the skills yet that I gained through our Associate Teacher program,” she said. But the study argues that there’s really no excuse — schools in California have the financial means to pay teacher residents if they so choose. Researchers created two hypothetical schools, one with students from high-income families like Bullis as well as a majority low-income school, and crunched the numbers using California’s Local Control Funding Formula (LCFF) to see if it would be financially feasible to support one teacher resident per grade level at a school. The results found that in both cases, 1 percent or less of discretionary funding would need to be committed to the program. Those modest figures may not pan out here in the Bay Area, however, because the study assumes teacher residents are paid an annual stipend of $15,000, roughly on par with annual income of employees making federal minimum wage. Fallon said the stipend represents a “midpoint” based on existing programs across the country, which range from no pay at all to just under a starting teacher salary, and that local schools and districts need to tailor their compensation based on the area’s cost of living. In the case of Bullis Charter School, associate teachers make anywhere from $36,750 to $47,300. “These are dollars that can be saved in better preparation upfront,” Fallon said. The hope, Fallon said, is that the Sustainable Funding Project will get more schools and school districts to seriously consider investing in residencies — whether it’s modeled on Bullis or not — and that public schools in California have the means to support an in-house teacher training program. “The hesitancy you most commonly see is the question of feasibility and affordability, and we think the money is available to move us in the right direction,” she said.